Top Deck Games / Card Titan – Star City Games In-Store Programs Homepage! Top Deck Games, a brick-and-mortar store in Westmont, New Jersey, has been in business less than three years (it opened its doors on Black Friday in 2011). In that short time, though, it’s emerged as a force in Magic tournament organizing. Nick Coss, a founder of Top Deck Games and its online counterpart Card Titan, answered some of our questions about TDG’s rapid rise and the challenges faced by new organizers. Go out there and try something different and awesome! Coss has collaborated with others on past events. A self-described “huge proponent of friendly competition,” he credits Mark Aronowitz, another Northeast-area tournament organizer, for his help getting in touch with noted artists of Magic’s past. 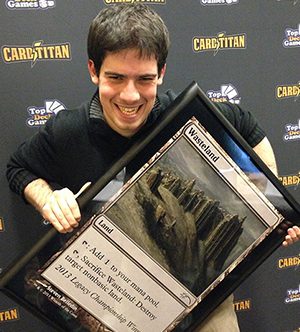 In addition to his work on Eternal Weekend, Coss has made Top Deck Games one of the most notable destinations for StarCityGames.com IQs. Later this year, Top Deck Games will become the most recently founded store to run a Premier IQ. Coss isn’t just a wide-eyed dreamer, though. Asked to name the most important thing for an organizer to “get right,” he listed three essentials instead. “Venue: Player comfort goes a long way. One of the quickest ways to make players grumpy is to jam them in a crowded room with inadequate lighting/HVAC/elbow room. Venue, Venue, Venue! “Staff: Staff your event appropriately. This includes judges as well as in-store employees. Be prepared for the crowds! “Communication: From start times, to entry fees, to prizes (especially if you’re planning on scaling them based on attendance), players don’t like surprises. Communicate well, and communicate early. Learn more about Top Deck Games on the store’s Facebook page. Preparing for Success Part 3 Game Night Is Here!